A Complete feed is a fortified grain/forage mix that is formulated with high quality fiber sources. This means that the feed contains enough fiber (in addition to minerals and vitamins) that a horse can live on that diet without supplemental hay or pasture. Most Complete feeds have a fiber content of 15% or more and use good digestible fiber sources such as alfalfa, beet pulp, and soy hulls. They have both the grain and roughage in them and are designed to (at least) partially replace the forage (hay and/or pasture) in your horse’s diet. Complete feeds have been around for many years and can really help during periods of hay or pasture shortages. In the past they usually contained undisclosed forms of fiber and were low in calories so required very high feeding rates. Today, a Complete feed is just that “Complete” and can be fed as the only feed and the lower quality, high fiber diets that are not fortified with vitamin and mineral are typically called “hay extenders”. 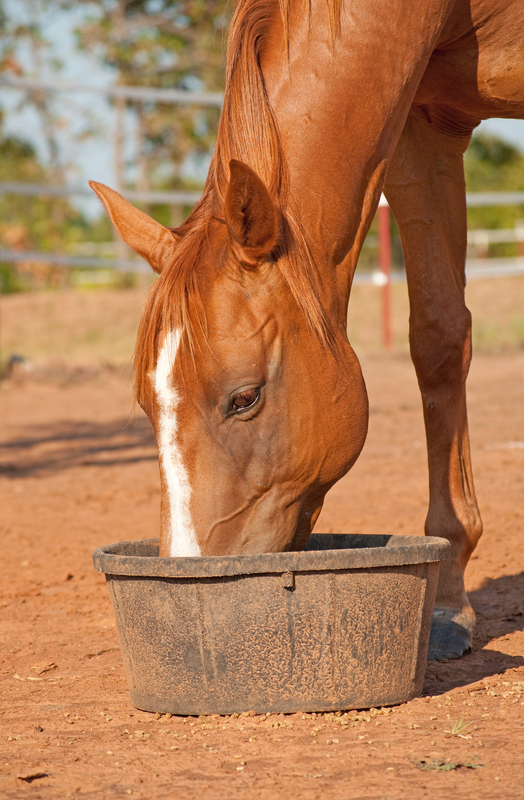 Why or When Should I Feed My Horse a Complete Feed? Many horse owners feed a Complete feed as the “grain” part of their ration along with plenty of long stemmed fiber. Due to the higher quality of fiber sources they are great if your horse needs an energy dense calorie source. 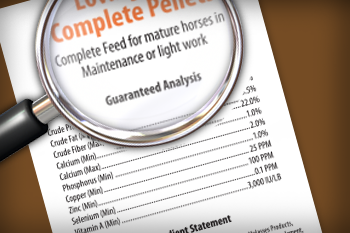 Many performance, broodmare, growth and senior feeds could be considered “Complete” feeds. In addition to the energy density here are some of the other reasons why you might decide to feed a Complete feed. 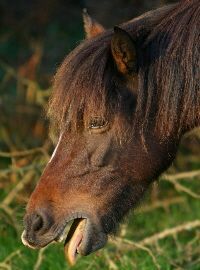 1) Health Issues: If you have a horse with poor teeth or no teeth that can no longer chew and swallow hay you might consider a Complete feed.They can even be soaked to form a mash or soup for these horses. A horse with respiratory issues that reacts to the dust in the hay would also be a good candidate for a Complete feed diet. Horses with ulcers generally do well with sources of fiber that are easier to digest such as beet pulp. These are called soluble fibers. Soluble fibers attract water and form a gel, which slows down digestion. Soluble fiber delays the emptying of the stomach and a stomach that stays full longer helps reduce the acid production. 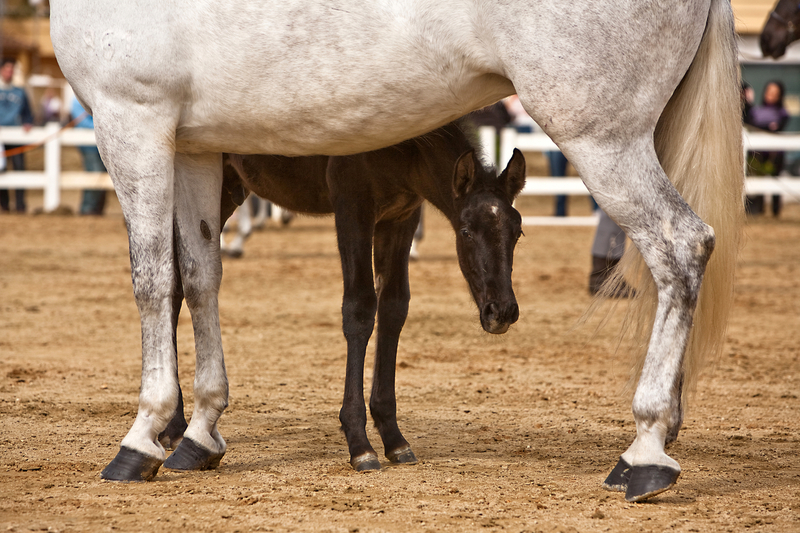 Slower stomach emptying may also affect blood sugar levels and have a beneficial effect on insulin sensitivity, which may help horses with metabolic issues such as Insulin Resistance and Cushings disease. A Complete feed that is beet pulped based would also have a lower Non Structural Carbohydrate (NSC) value (think lower sugar) so I would chose that type of Complete feed for these horses. 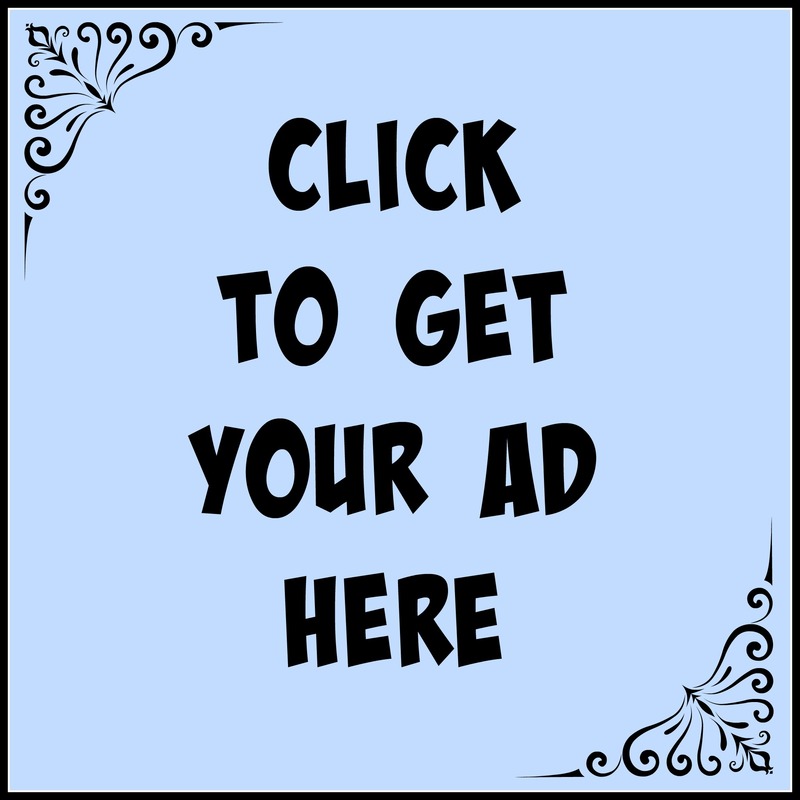 2) Hay Scarcity: When good quality hay is hard to find, obtain, or pay for you might want to consider a Complete feed. This can happen due to weather conditions such as drought situations or extremely wet conditions. Both of these weather extremes affect the growth of the hay (thus quality) and the ability of the grower to harvest. 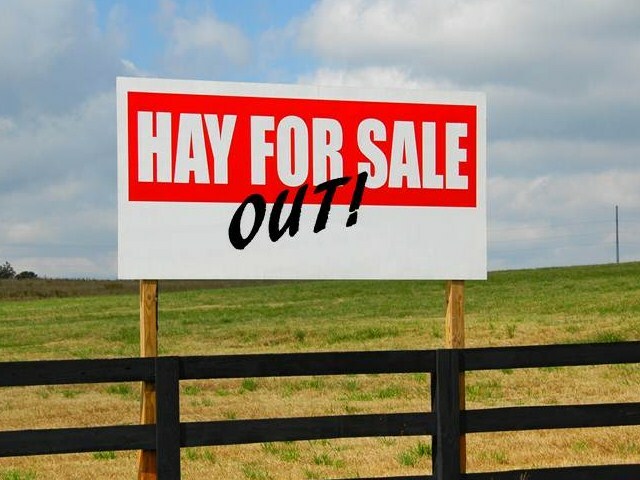 In these situations hay prices usually get more expensive as supply can’t meet demand. When hay is expensive Complete feeds may be a more cost effective way to make sure your horse gets enough fiber. 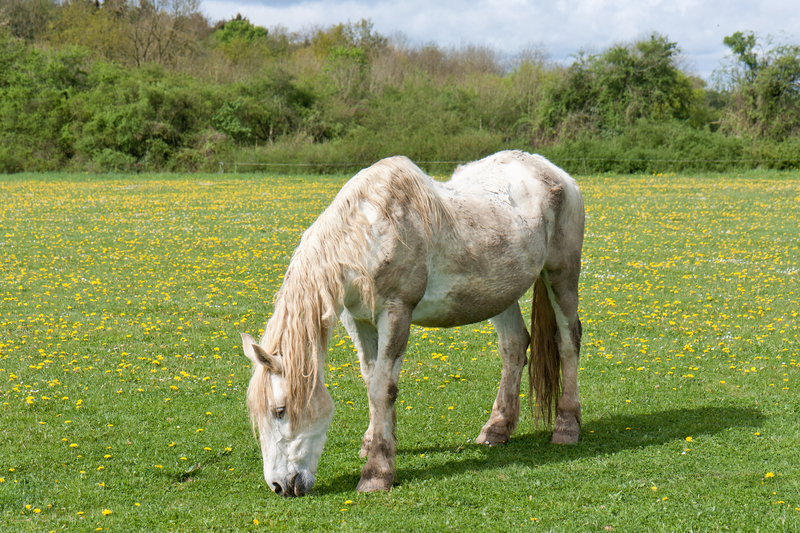 3) No Pasture: Drought and wet weather can also affect pasture conditions making it difficult for horse owners that depend on pasture to meet their horses’ forage needs. Complete feeds can help offset the negative impact of this on the overall ration. Some horse owners don’t have any pasture to begin with. Their horses live in dry lots so any additional sources of fiber help reduce the possibility of not enough fiber in the diet and negative behaviors such as wood chewing in these horses. Note: If a hay shortage, hay cost, or lack of pasture is the reason you are feeding (or considering) a Complete feed, I strongly suggest you continue feeding some hay in the diet. 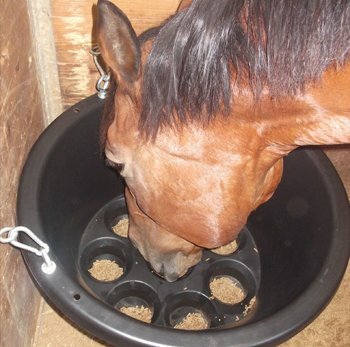 If you can’t feed your horse long-stemmed hay at all, consider feeding him soaked hay cubes. 4) Horses That Travel Constantly: I know a few performance horses that are on the road most of the year. These horse owners chose to feed a Complete feed so they aren’t too dependent on the reliability of the hay supply where they travel. By feeding most of their horse’s ration in a Complete feed they know the horse is getting all the daily fiber it requires, even if the hay at their destination is of poor quality. How do I Feed a Complete Feed to My Horse? Whether you chose to feed a Complete feed with hay or without, it is important to feed the recommended amounts suggested by the manufacturer. It is also important to consider lifestyle, metabolism, work load and health when deciding the amount of Complete feed to feed. The general rule of thumb for adult horses for most concentrates (non-forage part of the ration) is about .5 to 1 percent of your horse’s body weight per day. This is true for Complete feeds as well. So first you need to know your horse’s body weight and you also need to know what a pound of your feed looks like as many feeds are more than a pound per quart. When feeding along with hay or pasture, a typical recommended amount to feed a horse for maintenance is ½ lb per 100 lb body weight. So a 1,000 lb horse would get 5 lbs/day. 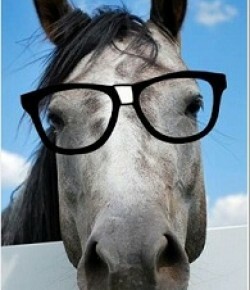 If no hay is fed, for maintenance a horse would receive 1.5 lbs per 100 lb body weight per day. So a 1,000 lb horse would get 15 lbs of Complete feed per day. As with all concentrates, Complete feeds should be split into at least two feedings per day. The more throughout the day the better. I prefer at least 3 feedings per day when fed without hay. Even if you work this is possible; AM, after work, then late PM when you top off waters. I also recommend using a slow feeder as well to generate more saliva and reduce the possibility of choke. 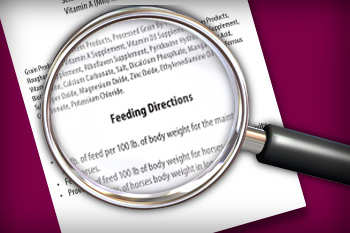 Each brand of feed is different so it is important to read and follow the feeding recommendations. They should list the recommended feeding amount both with and without hay on the tag. Are There Any Concerns with Feeding a Complete Feed? 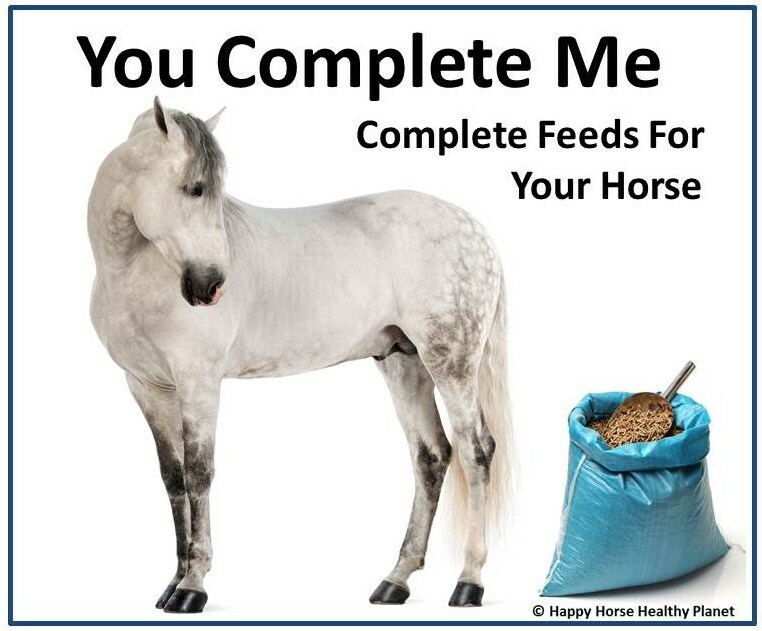 Complete feeds are a great way to add fiber to your horse’s diet but I feel that it should only be fed as a total diet in rare, or health related cases. They are excellent at providing concentrated nutrition but they have to be fed with careful consideration to overall horse health. Long stem forage is an important part of the horse’s diet and a good source of forage should comprise at least 50% of the horses daily intake whenever possible. Horses are designed to eat it and to digest it. Removing or reducing it can wreak havoc with their physical and mental well-being. Long-stemmed forages have to be chewed and digested slowly which is good for proper digestion and absorption of nutrients. 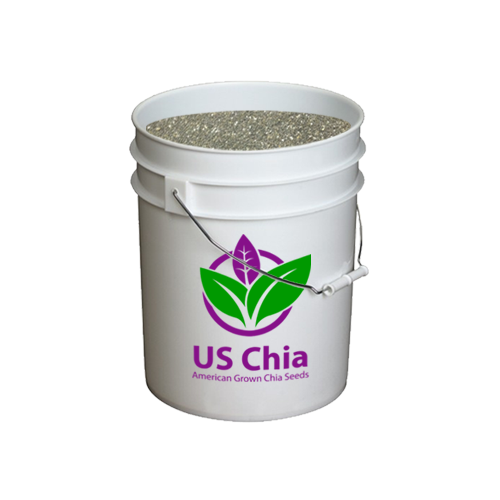 A pelleted or textured Complete feed can be consumed in minutes. Therefore, a horse that isn’t receiving enough fibrous stuff to chew may consume more feed more quickly—potentially leading to major weight gain, or even colic or laminitis. 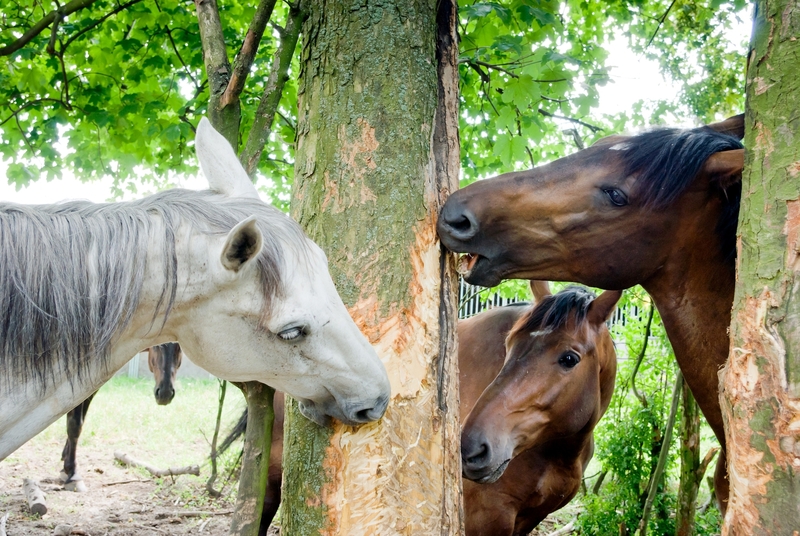 Horses without enough “chew time” might also develop vices, such as cribbing, wood-chewing or stall-walking. 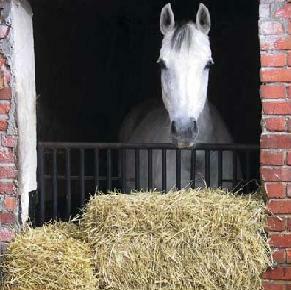 Always remember horses should be switched slowly from one feed to another and also when eliminating hay from the diet. When reducing the amount of hay fed, it is recommended to reduce hay over 1-2 weeks. In summary, if you read my blog you know I am always advocating a forage based diet so removing that and feeding just a Complete feed goes against this thinking. However, if you are already feeding a concentrate, or need to, I would highly recommend a Complete feed due to the quality of the fiber sources, lower NSC and better digestibility.